I decided to make a low carb pumpkin custard this time because I have loads of pumpkins to use up that I grew last summer. 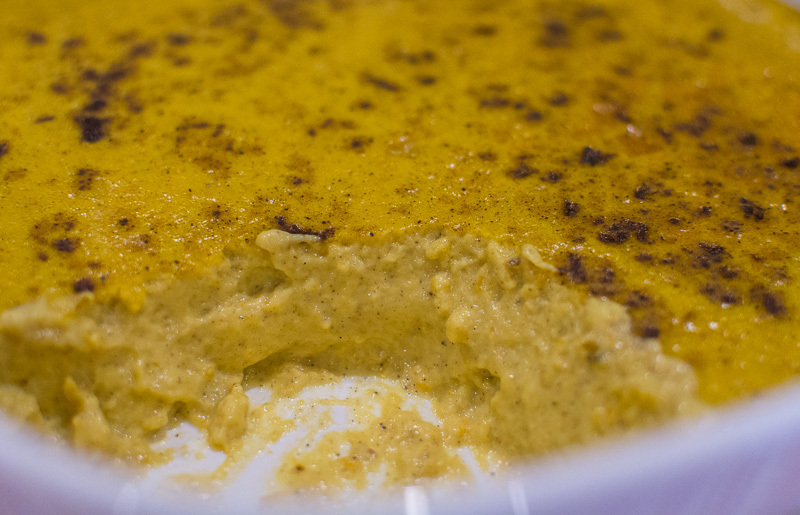 It is based around the Low Carb Baked Custard but I changed the spices around a little and added an extra egg to make up for the extra volume. My pumpkin puree was a bit rustic, 250g of roasted pumpkin doesn't turn out to be that much so don't try to puree it in anything big like I did. My puree was lovely and very sweet so I used less sweetener in this recipe, make sure you taste your puree before adding sweetener. This should work with coconut cream to make it paleo, I find with the pumpkin it has a similar texture to when I made a coconut cream version but I don't think nutmeg goes well with coconut cream so I'd personally omit the nutmeg. I just checked it and it has set a lot thicker now that it's cooled overnight, a bit too thick for me as I like a light textured custard, coconut cream will likely make it thicker again so it might not need the 4th egg. I wouldn't make this when trying to keep carbs very low as the pumpkin will really bump them up so save it as a treat. Next I am going to start playing with savoury custards. Cube butternut pumpkin and coat slightly with olive oil and bake until cooked through and caramelised. Remove from oven and puree until smooth, sieve might be the best way then allow to cool. Mix cooled pumpkin, eggs, sweetener and spices except nutmeg with a fork making sure to not incorporate air then slowly mix in the cream. Pour into 1-1.5 litre dish and sprinkle over nutmeg. Give a good tap and smooth out as many air bubbles as you can. Place into a roasted pan and add hot tap water to pan halfway up dish and place into middle rack of oven. Bake for around 40-45 minutes until custard has a wobble and remove from roasting tray to cool. I like mine best when its still a little warm before it thickens right up.